Written by Catherine Saxelby on Wednesday, 01 November 2017. A potato with 25 per cent LESS carbs? Does this mean they are low GI also? Would they be suitable for people with diabetes? And how do they taste? In this Snapshot, we taste test these new potatoes on offer via Woolworths supermarkets. What is a Spud Lite? Spud Lites are sold in a 1.5kg pack as well as Baby Spud Lites in a 750g pack only from Woolworths. They are grown exclusively by Zerella Fresh in South Australia where they are in competition with other types of potatoes such as white washed baby potatoes, red washed potatoes and mini microwavable round white potatoes, what we once called “chats”. 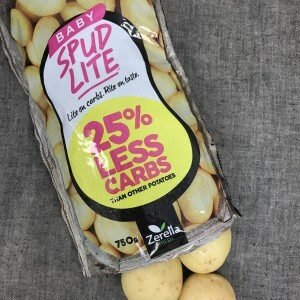 This is what I gleaned from talking to Damian at Zerella: Spud Lite is a potato variety that has come from natural cross pollination without any genetic modification. Their growing period is 20 to 30 per cent shorter than most other varieties, which means it needs less maintenance and feeding. It has also consistently shown that it has a longer shelf life than many others, meaning less greening and less wastage. I have been experimenting and have found they boil, mash and bake nicely – quite the all-rounder – which is good news. See my pics. At 8.9 per cent carbs, they are definitely less than the average of 12 or 13 per cent carbs for other types of potatoes. In addition, like other potatoes, these Spud Lites have a small amount of protein, virtually no fat or salt (sodium), little in the way of sugars plus a small amount of fibre. Traditionally potatoes give us vitamin C but the quantities are not as huge as for capsicum or oranges. But if one eats a lot of spuds and has them lightly cooked, then their contribution to vitamin C can be significant. I found a serve of these spuds to be roughly two potatoes which weigh about 125g. There were 11 potatoes in a 750g pack. So use the Per 100g figures and increase them by 25 per cent to work out a serve. How are they different to baby washed potatoes? At first, I thought these were the same as chats or cocktail potatoes that are sold for boiling and for potato salads. The ones that stay firm and retain their shape after cooking. However, after chatting to Damien, I realised that a lot of research and testing has gone into Spud Lites and nutritionally they are different. He told me they had discovered Spud Lites by finding that a couple of varieties of potatoes had a lower carb content combined with a higher moisture level. With their rolling verification, they often find their potatoes come in with even fewer carbs. They have done no testing of the potatoes’ Glycaemic Index and do not plan to. So unlike the Carisma no-one knows for sure if these have a lower GI – I suspect they may but can’t be certain. Cook and taste just like any other potato – the only thing you’ll notice is that they have a yellow flesh and skin rather than a whitish one. Limited distribution – you have to shop in one of the big two supermarkets to find these. Only 25 per cent lower in carbs although at times they may be lower but this is not noted anywhere. Not carb-free so you can’t eat them as if there was nothing there. A serve of 2 potatoes gives you around 11 grams of starchy carbs and 260 kilojoules. Cost a little more per kilo but not a hefty increase. A bag costs you $2.50 or $3.33 per kilo. Contribute carbs, fibre and a little vitamin C if you don’t over cook them. How do these Spud Lites compare with Carisma™ Low GI potatoes? Carisma potatoes are still sold in Coles supermarkets but carry no claims about their GI. This is because there was a little natural but normal variation in the Glycaemic Index of the Carisma potato (common to all produce) but it was enough to make them no longer consistently 55 or below, the official cut-off figure for a ‘Low GI Symbol’ food. See my older review of Carisma here. According to the Glycemic Index Foundation at the University of Sydney, the taste of Carisma™ has not changed and it remains significantly lower in GI (and carbs) than other popular potato varieties. For anyone with diabetes, it remains a better choice for delivering a slower, longer lasting rise in blood glucose. If you have diabetes, then a potato with slow carbs like the Carisma is still the best option. Now you have to buy it without any confirmation on pack that it’s lower in GI. Or you can slow down the rate of digestion by adding some sort of fat like butter, margarine or oil, or cooking and cooling them as when you make potato salad. Or adding some sort of acid such as lemon juice, vinegar or salad dressing. Should you buy Spud Lites? If you’ve already cut out most of the popular junk food (like hot chips and pizza) and only eat what you’ve cooked, these are useful. Or if you love eating potatoes! But there’s no point buying and cooking these if the rest of your intake is sub-standard. Remember they are only 25 less, not 100 per cent less, carbs.